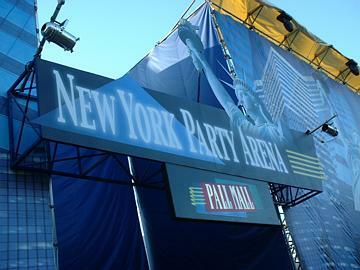 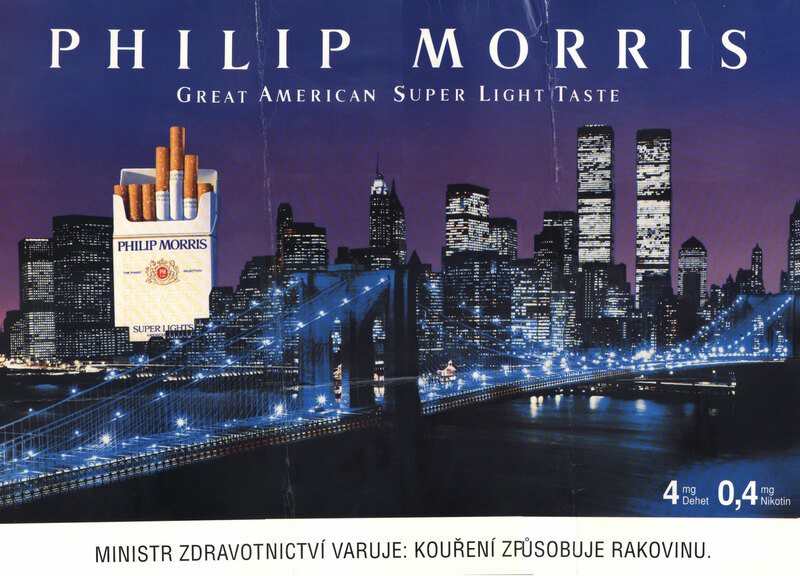 Great American Super Light Taste - A giant pack of Philip Morris cigarettes merges with the lit night skyline of New York City. 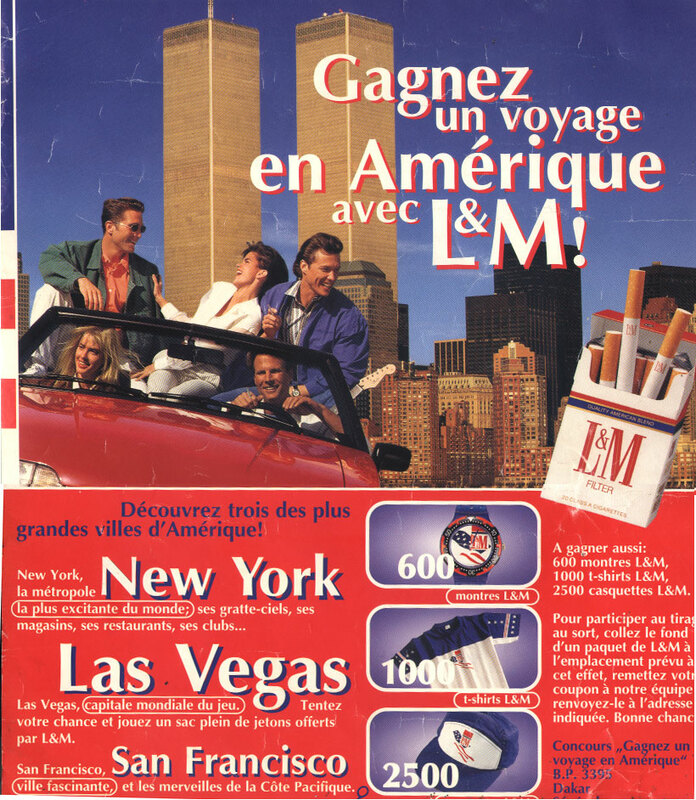 Features twin towers of World Trade Center. 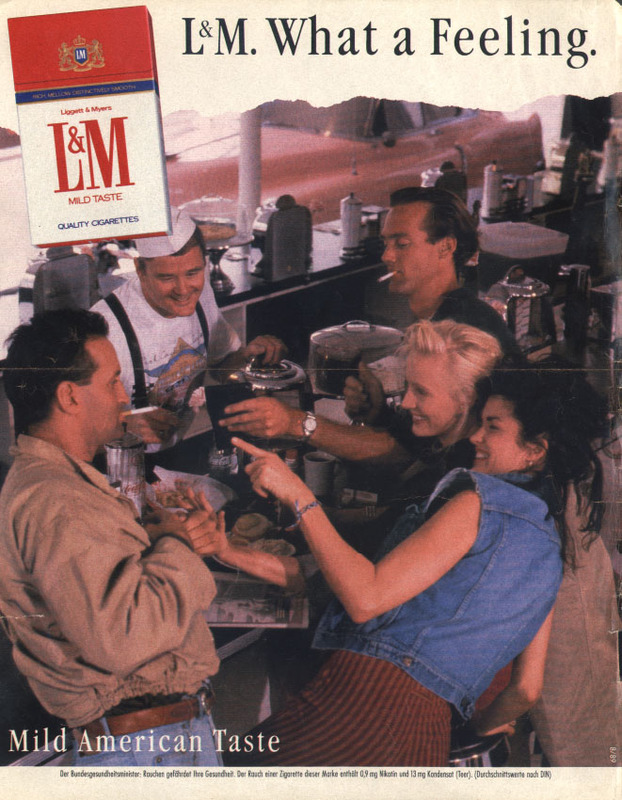 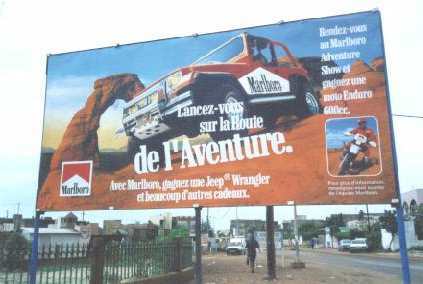 An American truckstop - L & M "Quality American Flavor"
Choose Your Trail (third front section)- Marlboro sweepstakes give applicants a chance to win adventure sports trips to the U.S.
" In my country, the Marlboro man is everywhere. 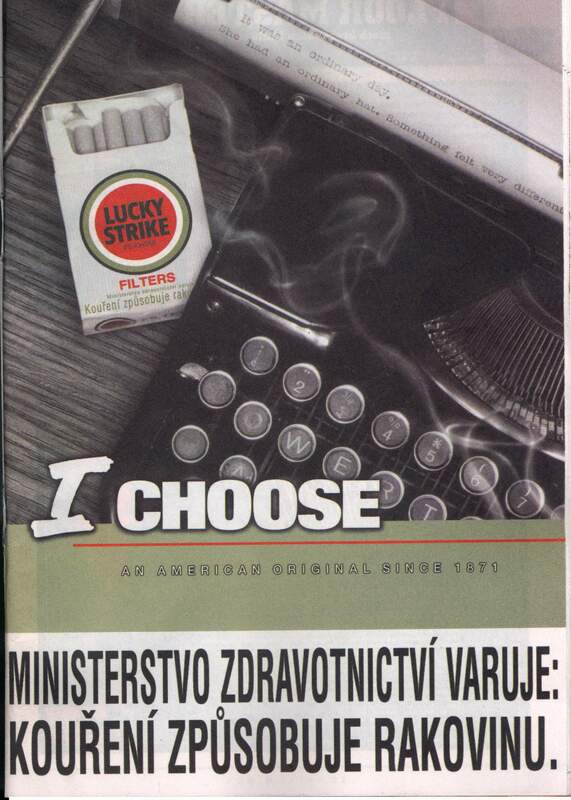 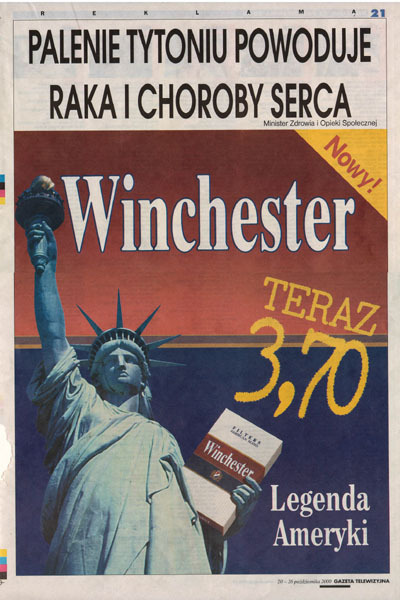 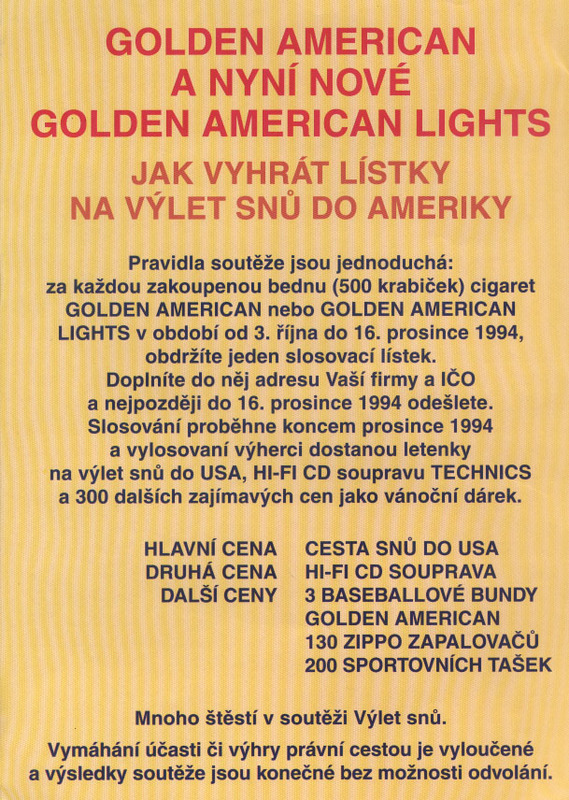 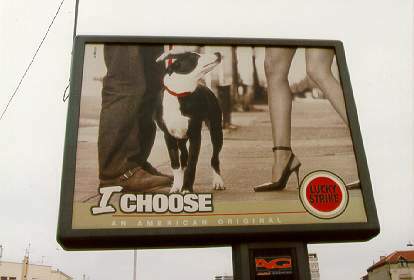 This advertising has been so effective that, in the Czech Republic, the slang term for a cigarette is amerika, as in give me an amerika."
Interestingly, focus groups with American youth by RJR Reynolds in 1983 found that connecting American themes to cigarettes was not popular. 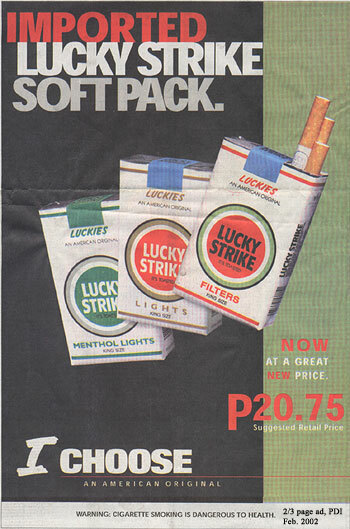 See: [doc-alert] Qualitative study on YAX ads- September 17, 2001. 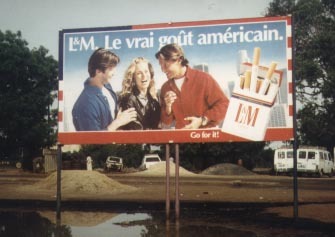 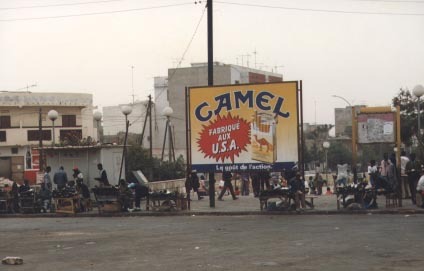 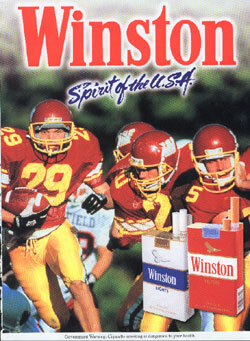 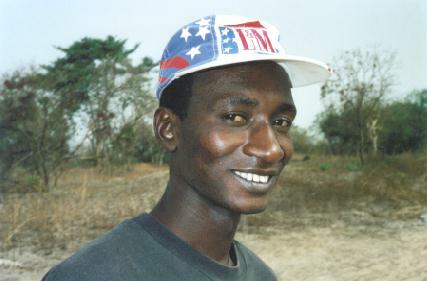 Excerpt: "...when viewing a cigarette ad that had the word "America" in the headline, several respondents pointed out that "It is not appropriate to sell America when selling cigarettes," because "It is too nationalistic," "America is not that great," and "It is not appropriate to sell America when selling cigarettes, or at least not in such a directly nationalistic way." 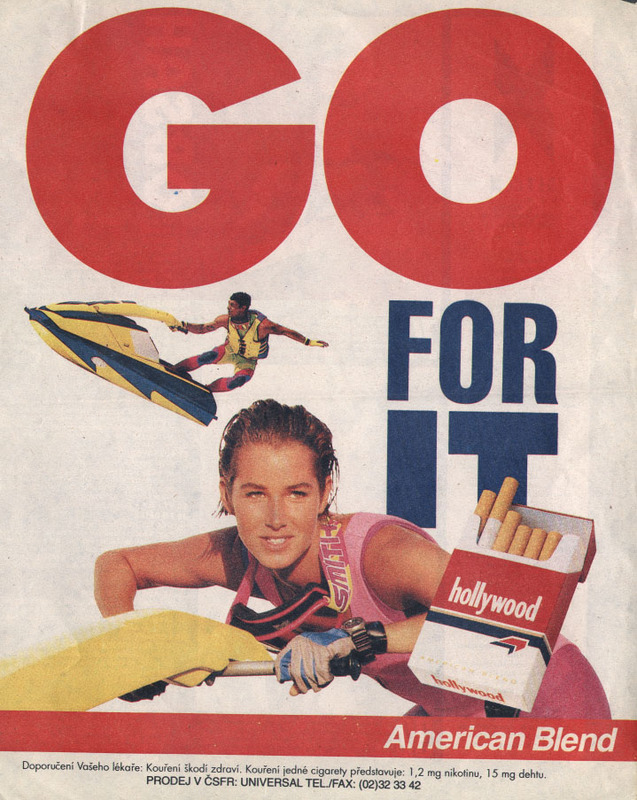 Cross-Country Attraction as a Motivation for Product Consumption by Marvin E. Goldberg and Hans Baumgartner, Smeal College of Business Administration, Penn State University. 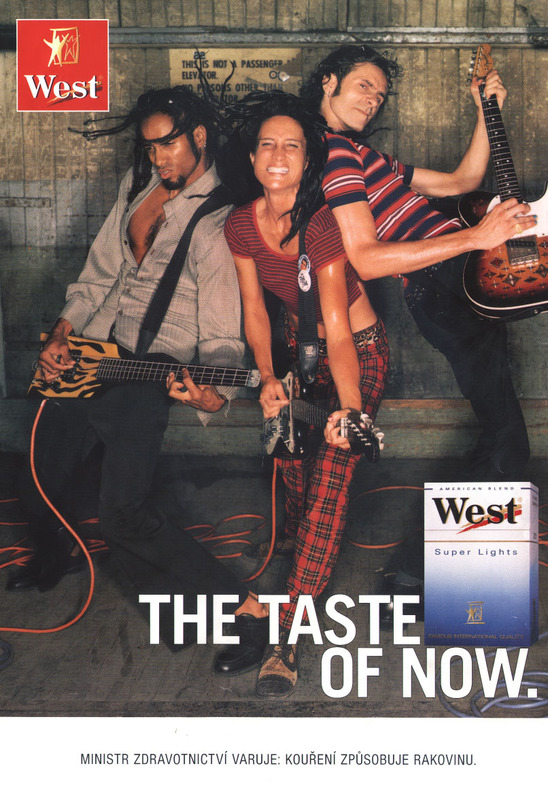 Excerpt: "...The results of this study suggest an affective process in which smoking is seen as part of an attractive American lifestyle. 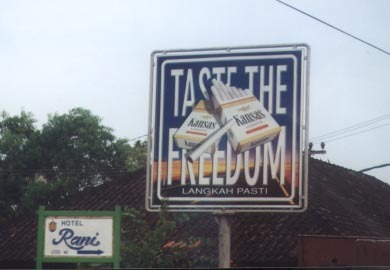 Thai teenagers who are attracted to the U.S. relative to other countries as a place they would like to live, are more likely to smoke and if they smoke, they are more likely to smoke the American brand, Marlboro. 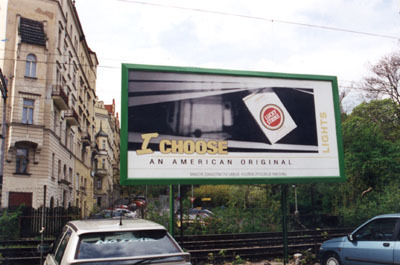 Exposure to American movies is related to heightened levels of smoking-related behaviors and to a heightened attraction to America. 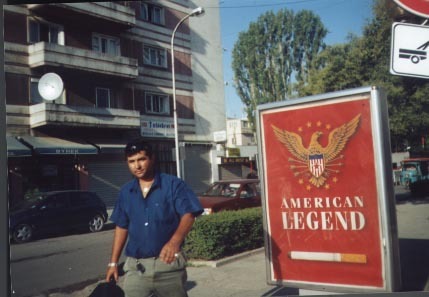 Those who both select the U.S. and overestimate the number of their peers who smoke in the U.S. are still more likely to engage in smoking-related behaviors. 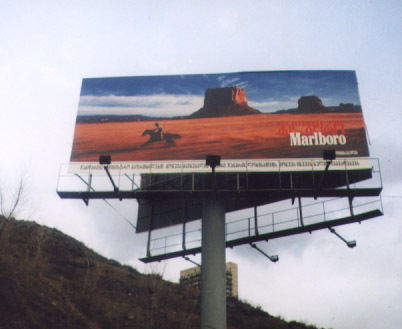 Marlboro advertising appears to be dominant in terms of reach and effectiveness. 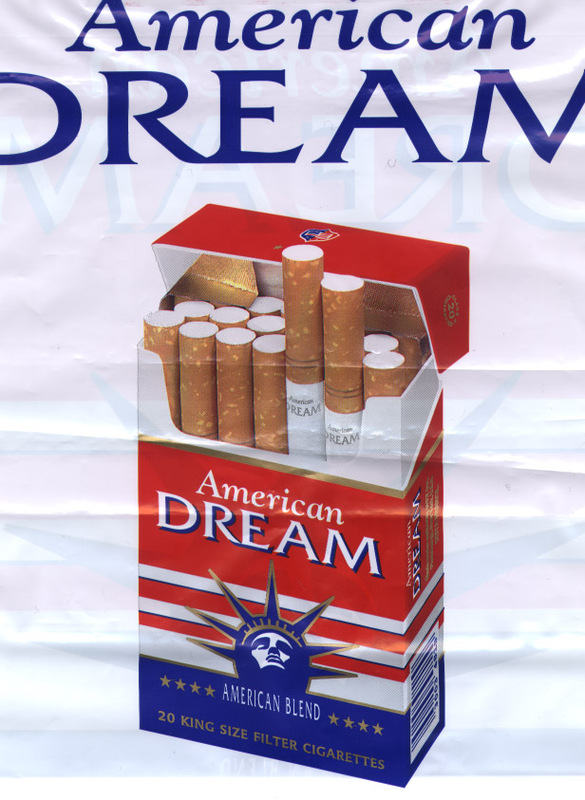 While none of these relationships are necessarily causal, the pattern is suggestive of emulation of the U.S. as a motivating factor in moving Thai teenagers to smoke." 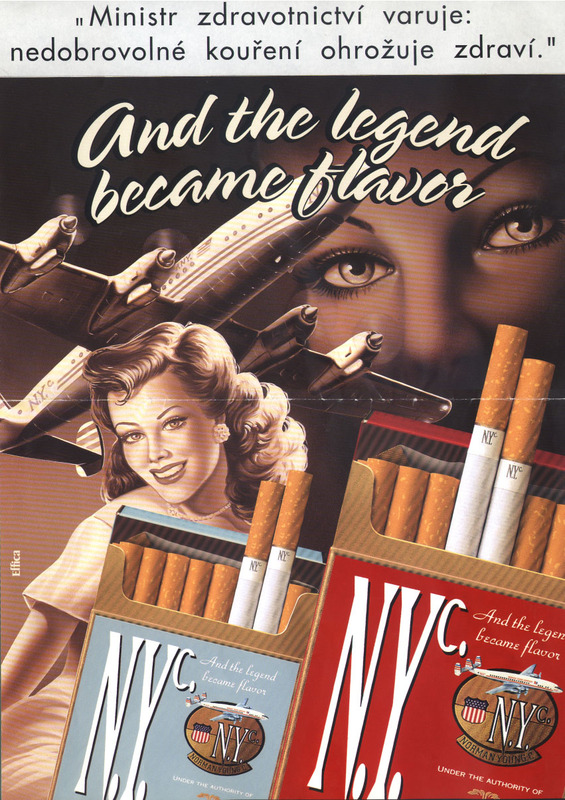 The study concludes that the data "suggest that an intervention that would effectively convince the 30% [of Thai youth] who are attracted to the U.S. tat most Americans their age don't smoke, could reduce the incidence of smoking by as much as 10%, or by 3% overall." 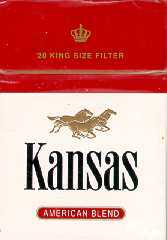 With the Marlboro Man leading the way, our wilderness is being tamed, once and for all.